A limited amount of games in the week, thanks to that damned commercial holiday nonsense, had really limited the amount of points we were going to see in this week's Newsletter and from our Player of the Week. The returns came in and 6 points was good enough to put our poster boy up top and after a quick tie-breaking process, Patrick Sharp of the Dallas Stars was our Player of the Week for Week Twelve. Somehow, in this shortened week, the Dallas Stars still managed to play four games, a game a day in the week, so they likely were benefitting most from the Christmas Break. Sharp managed at least a point in each game in the week, now running a 5-game points streak. An assist against Minnesota on Monday, one and one against Chicago on Tuesday, an assist in St. Louis on Saturday and then another goal and assist against the Blues at home on Sunday. There's his week, you can see he's really hitting his stride now. This big week lifts his totals up to 13 goals and 30 points in 37 games this season, ranking him 46th overall in pool scoring, good enough to be a 2nd round pick in the draft, if we were to do it over again today. That's important to note, because Stacey C. managed to snag Sharp in the 7th round and remarkably, he's not the biggest bargain of the round... but still, he's been a tremendous pick for Stacey. Stacey's team, however, hasn't had many of these great picks, as they finished the week in 20th, but still had a decent week, despite the shortened nature of it. This was a close race, until the final buzzer sounded on Sunday night. It was down to Brenda & Seward and Stacey M. and it was going to be a hard one. Same amount of goals scored in the week, same amount of wins in the week... up until that final horn sounded. 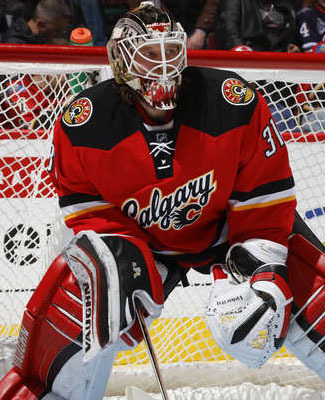 Karri Ramo came to the rescue of Brenda & Seward, giving them that extra 2 points, that extra win and a huge Mover & Shaker week, helping them to drive the standings and move right up into a very cozy position. I don't think there is any escaping the irony in this section of the Newsletter this week, as Ramo, a Flames goalie, beat the Oilers, Brenda's favourite team, in order for the duo to earn the Mover & Shaker nod. What was she doing picking a Flames goalie anyways, right? It was a pretty good group effort for the duo's team, as Ramo led the way on their team with 4 points and then he was complimented by Derrick Brassard of the Rangers, Filip Forsberg of the Predators, Nino Niederreiter of the Wild, David Perron of the Penguins... all having 3 points in the week as well. Four more players had a couple points each, while only one player failed to register a point on their side, which is very well-rounded scoring. How much of an impact did this week have? Well, the duo was in this same spot only three weeks ago and they finished that week in 6th place. This week, with a few decent weeks in between, now sit in a tie for 1st place, only losing out on tie-breakers and now sitting in 2nd place in the overall standings. Brenda & Seward's team have been very healthy and active this season, the biggest reason why they have been so successful. They currently rank 2nd in skater games played and their team ranks 4th in goalie minutes played. They have their players out on the ice a lot and thus, they're just sucking up a ton of points. At the opposite end of the spectrum, Benson may have had a few players playing this week, no doubt, but they were not sucking up much for points, rather they were just sucking air. Sure, I could have made that much worse, but I elected to be nice. Now, Benson's team is dealing with a couple of injuries, but it is only two injuries. Only two of his players managed to pick up points in the week and they were both defensemen! Alex Goligoski of the Stars had 3 points and Mike Green of the Red Wings picked up a point. That's it. 4 points was his week, 24 points worse than the Mover & Shaker. His team fell down to 24th overall in the standings, but on the plus side, his side is still 26 points away from last place, but even last place gained 10 points on his side. Benson's team is really going to have to wake up here soon, because another Waiver Draft may not help his cause much. John P. narrowly extends his Newsletter streak in 1st place to five weeks, as his side managed enough points to be credited as the 1st place team, but Brenda & Seward jumped up from 5th to a tie with John, now sitting in 2nd place. Jeremy's team couldn't quite keep the pace, dropping down to 3rd, now 7 points back of top spot, a small gap to make up, in the next week or two. Just outside of the money, we see Troy 6 points back of 3rd, Dale B. is 10 points back of the money, Neil is now 11 points back and Stuart is 15 back. One good week and they can be back in it, since we've seen it a few times already this season. Your team just needs to find a bit of a hot streak and they should be mixing it up with the dollars and cents before too long. Yawn! Ryan extended his lead in the pool to 30 points, thanks to some help from Robby Fabbri of the Blues and Artemi Panarin of the Blackhawks. Ryan's team didn't lead the week in rookie points, rather it was Cindy's team, which picked up 4 points to lead the pool. Jack Eichel did that in one game this week for the Sabres, but this was the production she was hoping he would have on a regular basis. Cindy's side is now 3rd in the race, but 37 points back of Ryan, not really making much noise right now. It's too bad she didn't pick up a rookie (or two) in the Week Nine Waiver Draft or else it could have been a little closer. We are still four weeks away from the All-Star Break, which will be the toughest test for our survivors, but we only have three teams left to worry about it now. Stuart was the latest team to fall victim to the survival of the stoppingest. Stuart was down to one active goalie, Chicago's Corey Crawford, and it came down to Sunday night's contest against the Hurricanes, where his side fell 2-1 to that pesky team from Carolina. This now leaves Jeremy, John P. and Allan left to scrap it out for the title and all three teams are staying fairly strong through this tough time. Allan and John each had a couple of wins in Week Twelve, while Jeremy only needed one win on Saturday to get the job done. It's going to be a little busier next week, with 48 games on the schedule, but we'll count down to the All-Star Break, where it could get very interesting. The PIM pool is getting very interesting and it's a surprise team that is really making all the noise. Wes continues to lead the pool, but his lead is slipping. Dale B. made up 15 minutes on Wes this week and now sits 18 minutes back of the lead, while Brian, Dale C. and our other established goon team, Derek & Dan, were all unable to really keep the pace. Dale B. could thank Scott Hartnell for a huge week in the penalty box, which has really helped his cause in this race. The goon team of the week, however, was actually Jeremy's team, which edged Dale B. 's team by a single minute, 31-30, but his team is 14th in the race, 117 minutes back of the lead. That would be hard to make up, between now and the end of the year, even with a couple goon picks in the Week Eighteen Waiver Draft. The Christmas Break didn't help the pool a great deal, as the games before and after didn't improve anything except for the penalty minutes, which saw an increase, thanks to a couple of our goon teams and a couple that aren't necessarily declared as goon teams. Scoring remained around 12 points collected per NHL game, but we saw slight decreases to injury in games played and minutes collected. Everything ramps up on Monday, where we'll have 48 NHL games in the week, which will include a quiet day for New Year's Day. Sunday night, the Anaheim Ducks lost the services of defenseman Cam Fowler, in-game against the Flyers, as he left the game with a lower-body injury, not long after registering an assist on the team's first goal of the night. There wasn't much for details after the game, so we'll be watching this one over the next day or two. If nothing else gets posted on the blog, it's fair to think that it will just be day-to-day with a lower-body injury. Tony's unlucky streak continues with this injury, his side finished the week in 21st spot and his side ranks 25th in skater games played already and 21st in minutes played for his goalies. Not a great year for staying in the lineup this year. A trio of Bruins will hit the blog this morning, as defenseman Colin Miller was a healthy scratch for the game against the Senators, while defenseman Torey Krug was a late scratch with an undisclosed injury and then in the game, forward David Krejci left the game with a lower-body injury, not to return. That's a lot of talent coming out of the lineup, which doesn't exactly make it a surprise that Boston lost to Ottawa, 3-1. We'll have some more info on Krejci, later on in the day. So, respectively, it was Eric, Tony and Dale B. having their players in that paragraph. I would imagine that Eric will get his defender back next game, while Tony and Dale are left to wonder about these injuries. Haven't seen much after Jeff Carter suffered an upper-body injury on Saturday night, so he will be listed as out day-to-day for the time being. Carter left the game against the Coyotes in the 2nd period, not to return, with the injury. This could be a bit of a karma bite for Kristy & Don, who jumped on Carter during the Waiver Draft, after Wes dropped him to goon up. Carter hasn't really paid off too many dividends since activation, only picking up 3 points in eight games. Michael Del Zotto was a late scratch for the Flyers on Sunday night, just before their game with the Ducks. Not much for updates on Monday, but the initial thought is that the injury is not serious, so he'll be day-to-day and there is a chance he could suit up for the team's next game on Wednesday. It doesn't sound too serious, but Grant is only 3 points clear of last place in the standings and he doesn't need another player down for his side. It has been a rather unlucky year for him and this is just piling on. After playing one game from an injury return, the Pittsburgh Penguins didn't want to put defenseman Kris Letang in a tough position in back-to-back nights, opting to scratch him for precautionary reasons. The injury prone defender likely doesn't want to miss more time this season, due to injury. Missing a game, for precautionary reasons, shouldn't concern Jeremy too much, but if his team wants to be on top of the standings, he'll need a healthy Letang. Missing one game now, so he can play more games later, seems to be a decent trade off.